Left to right: Eric Steinberg, Amy Kim Waschke. Photo courtesy Dale Robinette and Oregon Shakespeare Festival. The Winter’s Tale is one of Shakespeare’s stranger plays, most notable for its bear-themed stage direction and 16-year time lapse between acts 3 and 4, which marks the pivot from psychological drama into pastoral romance. Director Desdemona Chiang interprets the play through the lens of the Asian-American cultural experience, intensifying the tonal and aesthetic divide felt between the two locations in which the play takes place. By emphasizing this unique split between tragedy and comedy, the production differentiates itself from the rest of Shakespeare’s comedies. The first part of the play is set in Sicilia, here, the courts of feudal China. To illustrate the grimness and fear that pervades acts one through three, the characters and set are dressed in dark greys; only a few streaks of bright yellow break the solemnity. Interestingly, characters’ dress is based on location rather than national heritage – visiting king Polixenes (James Ryen) wears a muted tunic while residing in Sicilia, yet a more colorful outfit back home in Bohemia. 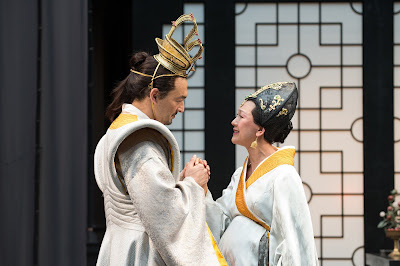 Sicilian king Leontes (Eric Steinberg) and his queen Hermione (Amy Kim Waschke) are the central characters in the first part of The Winter’s Tale. Steinberg’s Leontes conducts himself with cold, regal bearing, and his descent into paranoia doesn’t seem unexpected – indeed, from the beginning there is a threatening air about his performance that says that something is about to happen. Waschke’s Hermione, so honest and sympathetic that the audience can’t help but take her side, and her lady Paulina (Miriam A. Laube), the passionate, principled voice of reason, may be unable to change his mind, but their performances certainly convince the audience. Also of note is child actor Naomi Nelson as heir to the throne Mamillius – her performance is sweet without being saccharine. The play is cut roughly in half by the stage direction in which the character Antigonus “exits, pursued by a bear.” I mention this not only because many audience members anticipate this scene, but also because it is easy to fall into a trap and make the bear goofy or melodramatic. Chiang takes a risk in going for a spectacular rendition of the scene, yet it accomplishes what it needs to – it’s scary and unexpected instead of ridiculous. The transition into the land of Bohemia afterward is like a breath of fresh air. In contrast to the sterile, minimalist sets and dress of Sicilia, Bohemia is filled with bright colors and complex costumes. Loosely based on the American West during the 19th century, the second part of OSF’s The Winter’s Tale conveys the peace and harmony espoused in pastoral art without being corny. The characters are so inviting, they create nostalgia for a time and place that never existed. One of the standout performers in the second half is Stephen Michael Spencer as pickpocket and rogue Autolycus. Spencer has a gift for physical comedy, whether it’s snagging coin bags from someone’s purse or acrobatically concealing himself behind a set piece. His appearance onstage – and it occurs frequently – is practically a guaranteed laugh. As The Winter’s Tale ends famously with a merging of the tragic and the comic, the dramatic and the pastoral, Desdemona Chiang’s OSF production adds an additional layer by merging East and West. Anyone from a theatre veteran to someone just becoming acquainted with the stage could gain insight into one of Shakespeare’s most complex comedies. Part of the Oregon Shakespeare Festival 2016 season.